When Babylon 5 was renewed for a second season, it was clear some changes were needed. There was a great deal of positive acclaim for the story arc, the CGI and many of the characters and actors, but there were concerns about the stoic, haunted nature of lead actor, Michael O'Hare, and about his character leaping in a fighter to investigate every crisis that came along, which strained credulity. According to J. Michael Straczynski, this coincided with him struggling about giving Sinclair a connection to the mysterious alien 'Shadows', who would play a big role in the upcoming season at the same time that the mystery about the Minbari, a dominant storyline in Season 1 which featured Sinclair in a big way, would be fading into the background. Apparently amicable discussions were undertaken and O'Hare, who had been missing his old theatre life back in New York, agreed to depart but return for further episodes down the road when his character was needed. Season 2 starts with the sudden reassignment of Commander Sinclair to the Minbari homeworld as ambassador. Captain John Sheridan is brought in to replace him, which proves controversial as the Minbari hold Sheridan in disfavour for his destruction of a Minbari warship during the war by 'cowardly' tactics (using nuclear mines and a fake distress call). At the same time the station is in something of a crisis: Earth Alliance President Luis Santiago is dead, security chief Garibaldi is in a coma having been gunned down whilst claiming someone wanted the President dead. Elsewhere, Narn Ambassador G'Kar is missing and Minbari Ambassador Delenn is in a cocoon of some kind. "Interesting place you have here," is Sheridan's assessment. Season 2 charts the descent of the Galaxy from the pre-existing status quo towards fire, darkness and war. An ancient, exceptionally powerful and apparently long-forgotten alien race has returned to prowl the fringes of known space for their own ends. The Centauri are offered a chance to reclaim their place as the most powerful race in the Galaxy. Earth is riven by political corruption. The Vorlons are showing signs of ending their long isolation. Every story element that was set up in Season 1 is now put to use in the second season, with impressive and logical plot and character developments following. If Season 1 was setting up the guns, Season 2 is about watching them fire. Compared to the variable first year, the second season is much better and more consistent. The arrival of Bruce Boxleitner as Captain Sheridan injects some much-needed life and energy into the command staff, and it's clear he has a much better rapport with most of the other actors. He also convinces much more as a military leader and tactician. JMS has a tendency to give him slightly cheesy speeches from time to time, but he mostly handles these well and does superbly with a dark, intense performance during In the Shadow of Z'ha'dum, a pivotal episode which spells out what the stakes are in the overall story arc. There are many other key episodes, but other stand-outs include And Now For a Word (an episode told in the style of a news documentary about the station and its crew, revealing new information about the B5 universe) and Confessions and Lamentations (probably the best non-arc episode the series ever did), but the powerhouse episodes of the season have to be The Coming of Shadows and its sequel, The Long, Twilight Struggle. In the former, which won the 1996 Hugo Award, the Centauri Emperor pays a state visit to Babylon 5. Certain Centauri factions aligned with Londo attempt to use his visit to further their own agenda whilst G'Kar plots an assassination. However, the Emperor falls ill and devastating consequences for the entire B5 universe follow. Half a season later, in The Long, Twlight Struggle, the fall-out from the former episode reaches its horribly inevitable conclusion, culminating in the most powerful use of CGI in the entire series (Londo's face reflected in the windows of a Centauri battlecruiser as he realises what his modest political ambitions have led to) and an absolutely barnstorming performance from Andreas Katsulas as G'Kar as his world comes crashing down around him. The rest of the season could have been an anticlimax, but the season finale (The Fall of Night) sees events get even worse and leaves things hanging for the third season. Season 2 of Babylon 5 (*****) takes the world and story painstakingly set up in the first year and really runs with it, backed by increasingly excellent performances from the central cast. 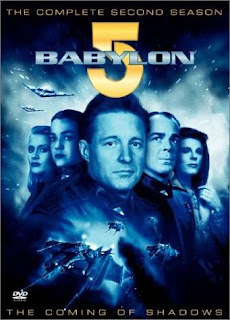 It is available in the UK and USA on DVD either by itself or as part of the Complete Babylon 5 set (UK, USA). Thank you for reviewing this series and bringing it back to people's attention. Without a doubt the best television series ever. The characters, the story, the dialog, everything is top class. I think Babylon 5 is often underrated, so I am pleased to see it get some additional attention. Yes, the dialogue wasn't always brilliant, and nobody needed another John Sheridan speech, but it was a great overarching story that was, for the most part, well told. Thanks for giving it a shout-out.